Contemporary large-scale paintings and sculptural hybrids are on view in NO MAN’S LAND: Women Artists from the Rubell Family Collection. The exhibition imagines a visual conversation between 37 women artists from 15 countries exploring images of the female body and the physical process of making. Works by Shinique Smith, Sonia Gomes, and Rosemarie Trockel make innovative use of textiles. “I like dancing between restraint and chaos,” says Shinique Smith (b. 1971, Baltimore), who collaged secondhand fabric and clothing into this large-scale work along with script-covered papers and photographs. 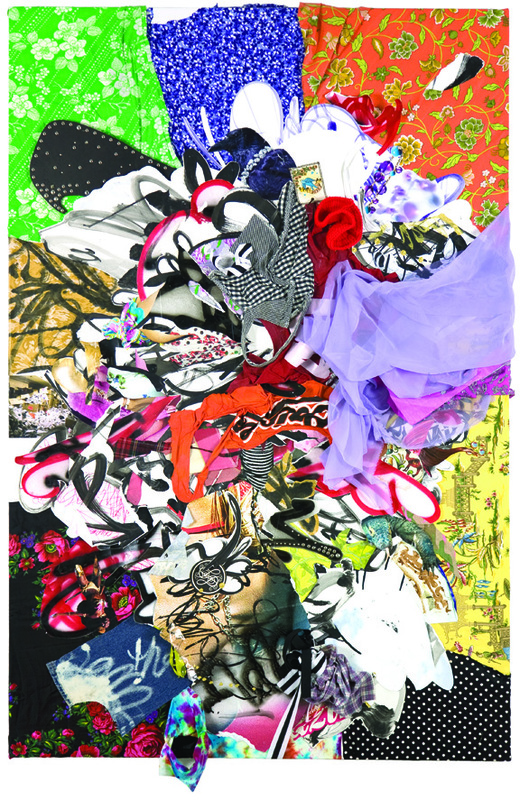 Smith’s complex, yet spontaneous-seeming art is inspired by our culture’s cycle of acquiring and discarding: “I think my work is very American, and the way we consume and cast off is unique to us.” She also cites a New York Times Magazine article that discussed how discarded clothing is baled and traded worldwide. Collecting textiles from friends, family, thrift stores, and other sources is part of Smith’s creative process. Smith, whose grandmother had a talent for interior design and whose mother is a former fashion editor, taps into her personal associations—popular culture, graffiti and calligraphy, her family, and her hometown of Baltimore—to create eclectic and energetic work. Like Smith’s works, expressive hanging sculptures by Sonia Gomes (b. 1948, Caetanópolis, Brazil), use textiles to explore identity and memory. Three of her works are on view—two from a series of pieces titled Made in America, and Tantas Estorias (Many Histories). 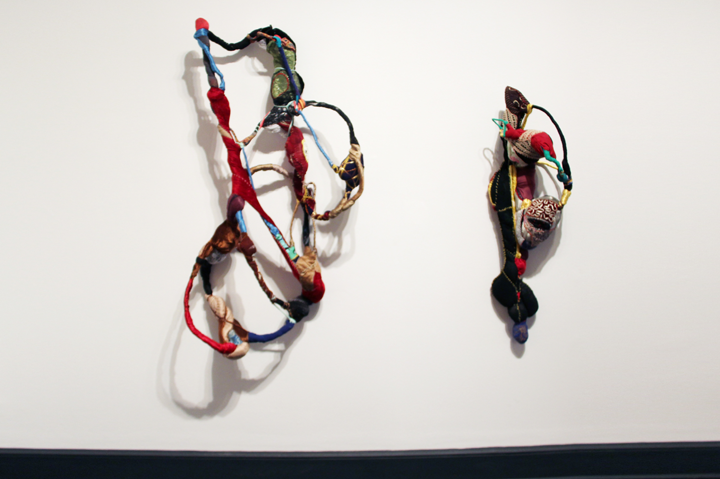 Gomes creates these sculptures by wrapping, twisting, and stitching found or gifted textiles over wire armatures. Organic shapes evoke organs, outlines, or sacred objects. Gomes’s works are inspired by her family—her father’s family worked in a textile factory, and she was influenced by the traditional dress and rituals of her maternal grandmother, an indigenous spiritual healer and midwife. Textile works by Rosemarie Trockel (b. 1952, Schwerte, West Germany) also reflect the close relationship between her medium and meaning. Featuring repeated patterns stitched by machine, Trockel’s “knitted pictures” are attached to wood frames like those used to stretch paintings on canvas. Trockel questions the gendered connotations of materials, as well as the distinction between “fine” arts, such as painting, and craft. “I tried to take wool, which was viewed as a woman’s material, out of that context and to rework it in a neutral process of production,” she says. 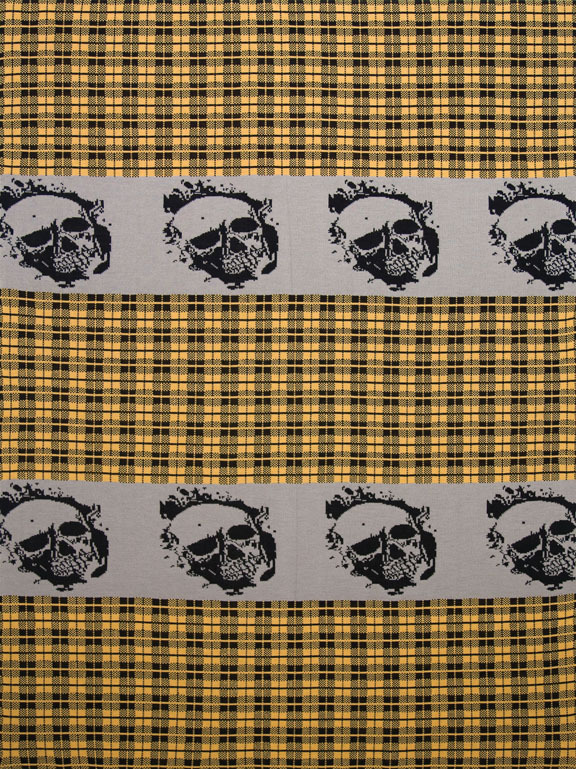 NO MAN’S LAND includes three of her knitted pieces—one with a pattern of skulls, another with stripes, and one that is a large, dark field of color.